Are you searching for specialty grocery items and holiday cheese gifts online? 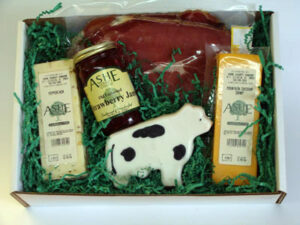 Food gift baskets of cheese, specialty meats, crackers and jams are a huge hit for any foodie or food lover. Skip the usual selections that have been well overdone and overplayed throughout the years. Everyone knows these brands that are being referred to, no one needs to name them. That wouldn’t be nice or prudent; however, it is hard to feel special when you are given a box that has been thrown together without much care and mass produced for sale in big box stores. If you are trying to find special cheese gifts online, check out our online cheese store stocked with a huge selection of different holiday cheese gifts online. Prices range from just over ten bucks to well, the possibilities are endless for the higher range. Our cheese gift baskets are perfect no matter the occasion you are celebrating. Head over to our online cheese store where you can buy handmade and homemade cheese items fresh from our factory. Our cheeses are made with high quality, fresh ingredients, that we source directly from local farms in the Blue Ridge Mountains of North Carolina. Our cheeses are praised by many, loved by all, and known among locals as being a large part of our area’s history, industry and commerce. We strive to give back to our community, and we have remained a small, cheese factory that supplies cheese to a great deal of businesses, restaurants, schools, and individual buyers. We also routinely host school groups, church groups and any visitor that wants to stop in and tour the factory and see how cheese is really made. Our factory, which dates back to 1930, is located in a historic, downtown mountain town called West Jefferson. Here, the New River meanders its way over our mountains and creates some of the most picturesque scenes in the country. If you’ve never tried any of our cheeses you are missing out. Stop in, or order online and give it a try! We ship our cheeses everywhere! Many of our buyers have tried our cheese while on a vacation to the mountains, or have been introduced through friends and fallen in love with the taste, texture and special love that goes into creating each block.